SkyDrive has made recent changes (August 2012) that may cause sourced images to not show. Especially for my “boilerplate” at the bottom of posts, I source little images from a SkyDrive album called “Utilities”. Prior to August 1, 2012, the sharing of this folder was set to “People with a view link” and worked perfectly across my various blogs. The links worked fine, of course the readers had no clue unless they moved the pointer to the image placeholders. Changing the sharing setting to Everyone restored the images to operational status. 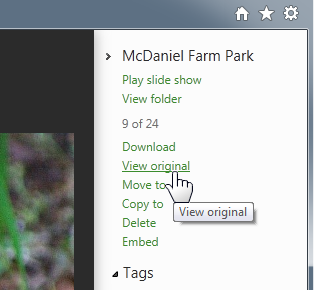 If you notice that your SkyDrive sourced images no longer show up in your posts, check the Sharing setting. Click Sharing to display the settings, click Share folder. In the next dialog click Get a link. Click the Make public button. You can ignore the public share URL provided. Click the image, in the information pane on the right click View original. Then copy the URL from the browser address bar (Ctrl+C). This does mean that your sourced images have to be public, and when people get into your SkyDrive they can see the pictures. It also means that Microsoft is more careful with the access controls, and that is really a good thing. With the recent changes to SkyDrive there is good reason to review and expand on linking to SkyDrive albums in blog posts. Windows Live Writer has offered a very nice tool for a long time. It still functions just the way it always has. Old links to SkyDrive albums operate just as they did when they were placed into posts. 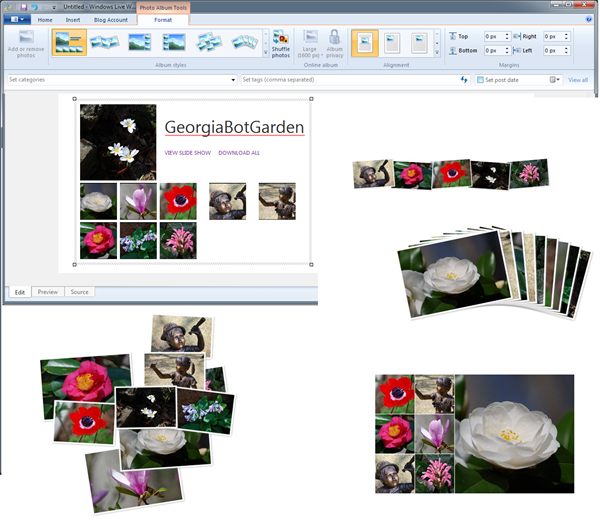 Live Writer provides a tool on the Insert tab, Photo album, that downloads images from a SkyDrive album, creates a collage of thumbnails, and generates the necessary hyperlinks to the album. The illustration here shows the command location. There are two options, “Create online album…” and “Add online album…” For most occasions the second option, to link to an existing album, is the preferred route. The album should be public, or in the vernacular of SkyDrive “Shared with Everyone (public)”. 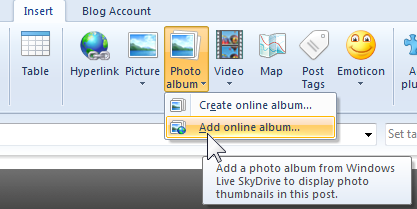 This option allows importing from and linking to a SkyDrive album that resides in the root of the SkyDrive. That is, you cannot use albums that are sub-folders. This may seem like an unreasonable restriction, but farther down I will show workarounds for that. You can use any SkyDrive that you have full access to, you are not limited to just one or to your own. If you have the credentials to a SkyDrive (login name and password, and, of course, the right to do so), you can use it in Live Writer. 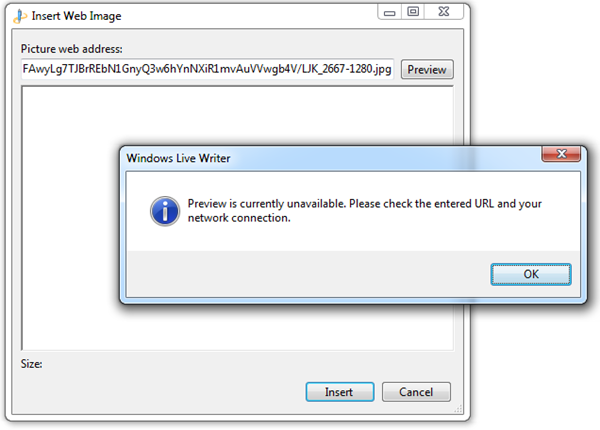 In fact Live Writer will store the credentials so selecting the SkyDrive you want is just a few clicks. 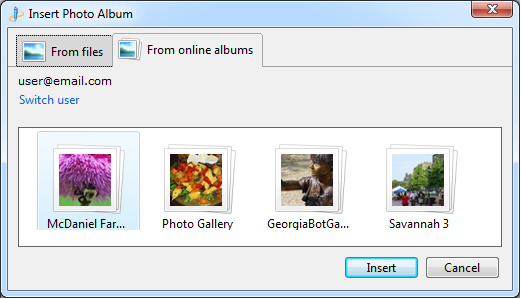 The Insert Photo Album dialog is shown here. The first step is to sign in. The dialog asks for the Windows Live ID, this is now called Microsoft account. Note the drop-down arrowhead at the end of the field, this brings up stored credentials. Once you are signed in, the dialog downloads album information. As already mentioned, these are albums in the root location of the SkyDrive. Click on the album you wish to insert and click Insert. 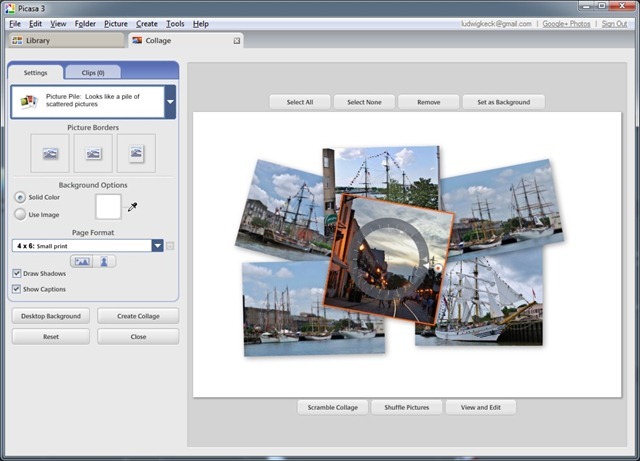 Next, images are downloaded and the default collage is generated. Clicking on the collage enables the Photo Album Tools tab. The ribbon shows the available arrangements and clicking on an “Album style” instantly rearranges the thumbnails. There is also a “Shuffle photos” command – each click re-arranges the size and location of the thumbnails. The code for the album link already contains the hyperlinks to the album. This is simple and straightforward. It gets a little more complicated if you wish to link to an album that is a sub-folder in another album. The approach outlined above does not work for sub-folders, they are simply not shown in the Insert Photo Album dialog. So there are two approaches you can take. Move the sub-folder temporarily to the SkyDrive root. The latest version of SkyDrive permits moving any folder to any other or to the root. This is very quick. Do be careful that there are no naming conflicts, if necessary rename the folder first before moving it. After the folder, or album has been moved to the root the Live Writer insert tool can be used as described above. Once the post is completed and saved, the folder can be moved back to its original location. SkyDrive is smart enough to internally take care of all the links. Yes, that is right, you do not have to worry about the folder URL. The other method is to make your own collage, insert that as a picture, then link it to the SkyDrive album. 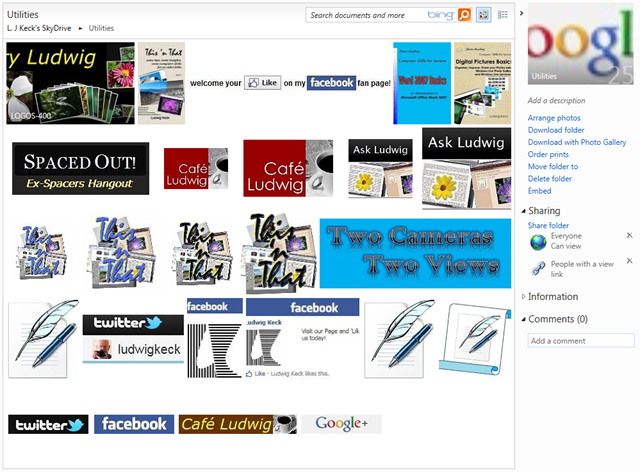 There are numerous ways to make a collage, one of the easiest is using Picasa. 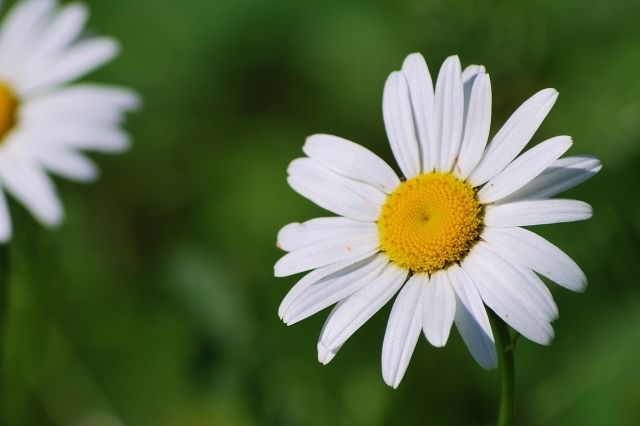 Picasa lets you set the background color (or a picture) so you can match your blog background. Each photo can be sized, rotated and shown on top or sent to back. Making a collage this way lets you arrange it just the way you like. Title the completed collage with whatever message you want to show in the tooltip. Then insert the collage picture into the post in Live Writer. Now all that is left is to link it to your SkyDrive album. That is also quick and easy. Open your SkyDrive album. Click on the first photo so it is shown large. Click on the URL in the browser address bar. Click Ctrl-C to save the URL to the clipboard. Then use the Hyperlink tool in Live Writer to assign that link to the picture. Here is how such an album link would appear. I chose the title “view album of Tall Ships in Savannah”. Try it. For a post in my photo blog Gallery Ludwig click on the picture below. This photo was inserted and then rotated in Live Writer. Live Writer has an array of useful Picture Tools. UPDATE 10 December 2011: SkyDrive has been updated, URLs are again easily accessible. 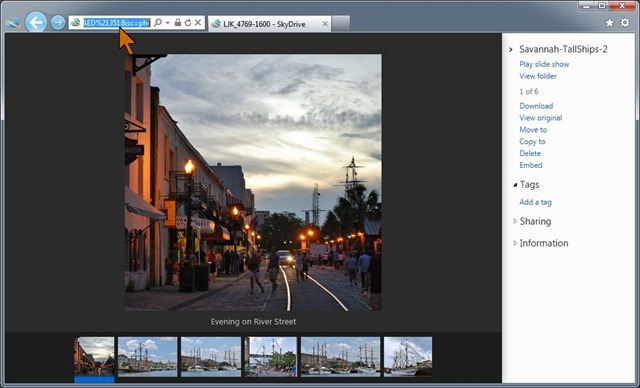 See Sourcing photos from SkyDrive is now easy. 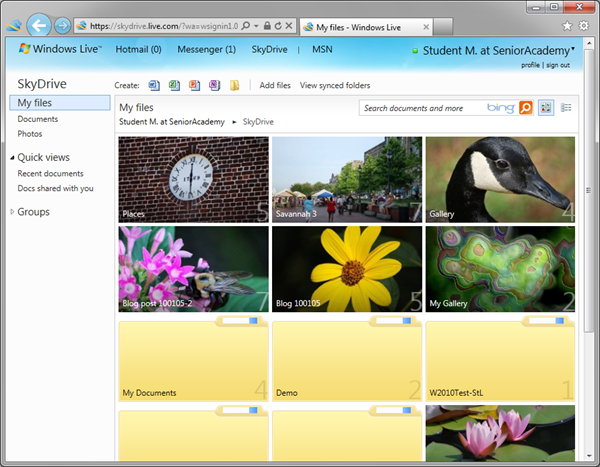 Windows Live SkyDrive offers a good amount of storage – 25 Gigabytes – and has nice photo albums. Unfortunately, at present there is not an easy way to determine the web address, URL, of images in SkyDrive. 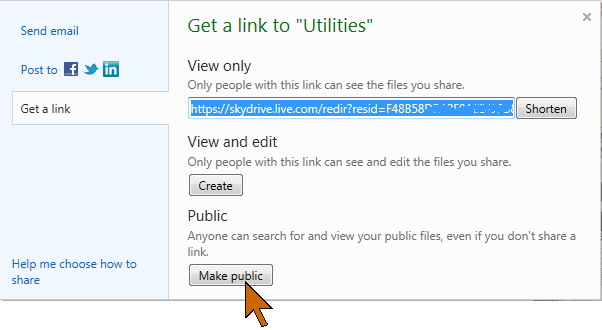 One work-around is explained over at This ‘n That: Getting the real URL of a Photo on SkyDrive. If you need to get the URLs of several photos this becomes a real pain. There is an interesting way to get the web address of all the photos in a root level SkyDrive album that has sixteen or fewer images. Still not easy or straightforward, but it works. Windows Live Writer has a neat tool for including a SkyDrive album. 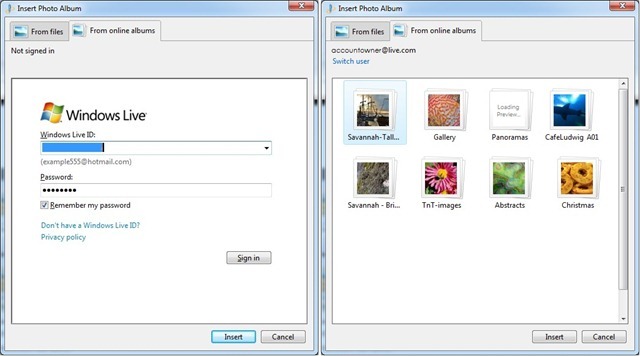 On the Insert tab in the Media group click on Photo album and select Add online album… This opens a dialog that allows you to log into your SkyDrive and then shows icons of your albums. Note that you cannot reach an album inside an album, this works only for root level albums. Click the album you want and then click Insert. 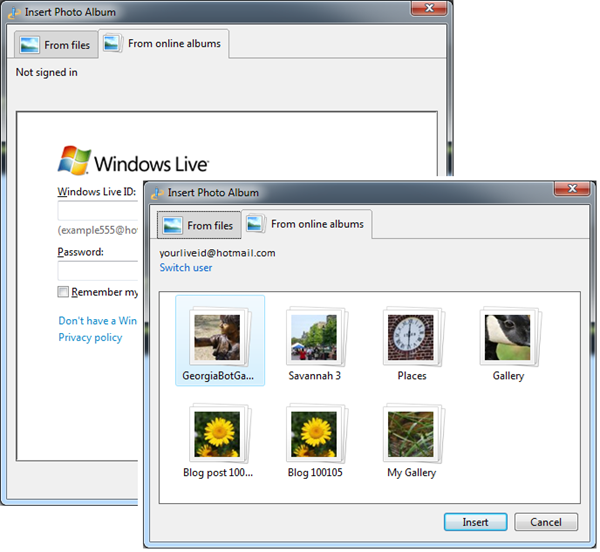 Windows Live Writer downloads the photos from the album. Only sixteen will be downloaded if the album is larger than that. The default album presentation shows a large thumbnail and a group of smaller ones. You can leave that nice grouping as part of your post, but for this discussion we are after the URLs of the photos. Click the Source tab (lower left) to view the HTML code of the post. For the album Live Writer will have generated a large block of code that includes the actual web addresses, URLs, of the photos in the thumbnails. The Live Writer Find command does not allow copying the found text with the search box showing, so it is not of much use for this task. I copy the block of code and paste it into Notepad. Searching for the the URLs and copying them is much easier there. There are a number of URLs that are not of interest (the “VIEW SLIDE SHOW” and “DOWNLOAD ALL” links) so I like to search for “livefilestore”. Be sure to copy the address from “https:” all the way to the next quote mark. Actually the last part after the image file name is not needed, the text “?psid=1” can be safely removed from the address. Copy those URLs and save them in a document so you will not need to go through this exercise again. Also make sure that the addresses work. I always paste the first one into my browser address field and take a look. The address should take you to the image all by itself. The image on the right links to the full size photo on SkyDrive, click on it to view it large. Once you have the URLs to your photos you can use those addresses to link to the SkyDrive image. Of course, the primary use will be to show the photos in blog posts. There is some bad news I have to share. If the photos are large, Live Writer cannot handle them. Let me explain. 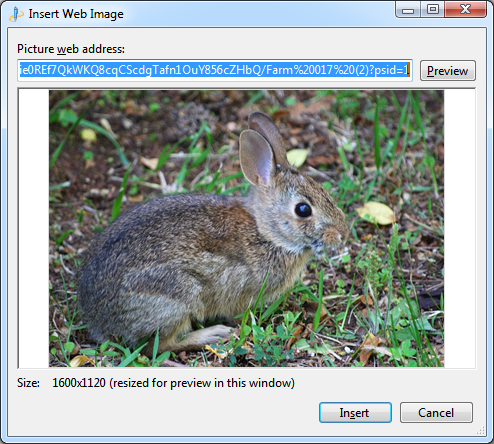 To insert a photo you select From the web… on the insert Picture command (on the Home or Insert tab). The URL is entered in the Insert Web Image dialog. If Live Writer is unhappy with the image you get an error message “Preview is currently unavailable.” You can click OK and then Insert. This may or may not succeed. For photos in posts the image size need not be screen-filling, and Live Writer handles smaller images just as you would expect. The photo below is just 640 pixels in the larger dimension. This also has the advantage that it loads quite rapidly. The photo below comes from the album collection inserted farther down, but it links to a larger photo in another album. When you include the album feature, a viewer has access to your public albums (and documents!). Using the URLs by themselves provides no such exposure, and allows you to lay out your post just the way you want. One other downside: Microsoft is constantly “improving” SkyDrive and Windows Live applications. The procedures given here worked as described in October 2011. They might not work by the time you read this. Sometimes a single photo just is not enough. 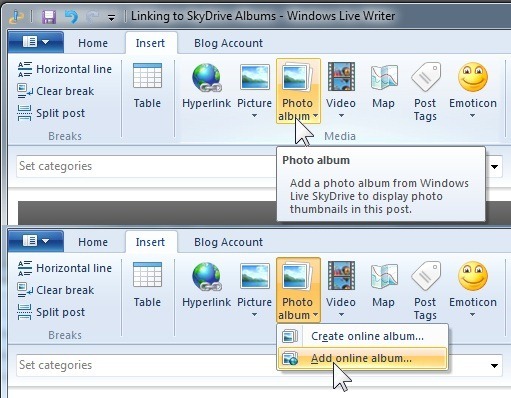 Windows Live Writer offers an attractive way to insert a link to a SkyDrive album. You can select from a number of layouts to show thumbnails from the album. Here is an album of photos from the Georgia Botanical Garden. This is a working link, of course, just click on any part of it to see the SkyDrive album. 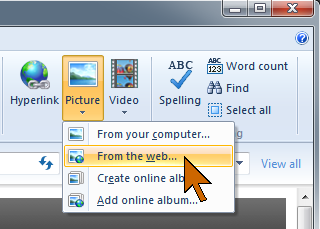 As you are writing your article in Windows Live Writer , click the Insert tab. In the Media group click Photo Album, then select Add online album… The command is illustrated here. If you are signed in to Live Writer the insert dialog will download information from your SkyDrive. You can change to another account by clicking Switch user. Select the album that you wish to insert by clicking the thumbnail, then click Insert. The default layout, called “Album style”, is the first one shown in the Photo Album Tools Ribbon which comes up when the album set is clicked. Note that there is a Shuffle photos command to change the order of the thumbnails in the set. Illustrated below is the Photo Album Tools Ribbon and a selection of the album styles that are available. Just click on another style to rearrange the looks of the thumbnails. The title of the album will be shown as it is on SkyDrive. This can be edited by just editing the text – as you can see in this article. There will be two links added to the thumbnail set, “VIEW SLIDE SHOW” and “DOWNLOAD ALL”. These cannot be removed. The “VIEW…” link with take your viewer to your SkyDrive album. There the visitor can step through the photos – unfortunately the automatically running slide show is no longer available (as of July 2011). Your visitor can download the album from the blog or from the SkyDrive album. 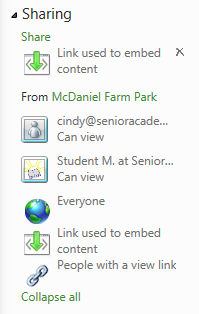 Please note that visitors have access to all of the public folders in your SkyDrive. 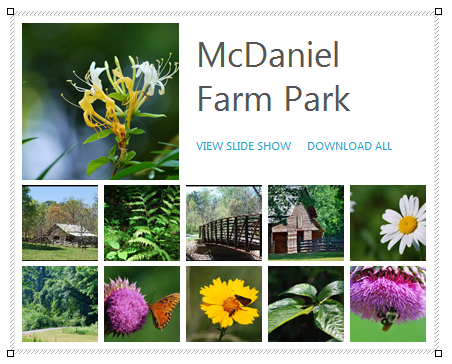 You can really dress up a post with these thumbnail sets and make your photos in SkyDrive available to your readers. Illustrating blogs with images makes them more interesting and informative and Live Writer makes the process of inserting pictures very easy. You can use photos from your computer and Live Writer takes care of uploading them to your blog file store. Images can also be sourced from other locations on the web. 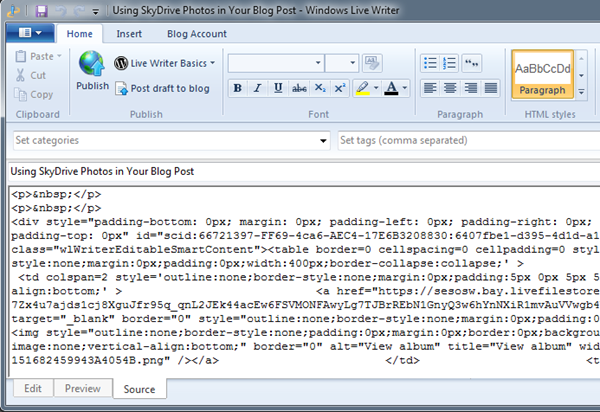 My post “Sourcing blog post images from SkyDrive” explained the process in detail. The recent facelift of SkyDrive introduced changes that necessitates these revised instructions. 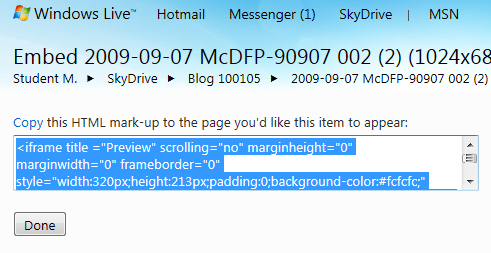 The look of the new SkyDrive has been handsomely improved, more of that is covered in my post “The new SkyDrive – Bouquets and Brickbats”. When you display an album the thumbnails are larger and show the image in correct proportions. The next level is similar to the slide show view in the previous version. There is no additional view, as before, that shows the image in an otherwise empty browser window. That is where one got the image URL in the past. REVISED AFTER POST – The “embed” code does not work! It is stripped during publishing. DO NOT USE THIS METHOD! It looks like this and there is a hyperlink to the SkyDrive page of this image. It work in Preview, but during publishing the code appears to get stripped. Nice, quick, you couldn’t ask for more. Or could you? Click on the image and the tools in the Ribbon are greyed out. There is no Picture Tools tab. You cannot change the size, location, nor specify text wrapping. Yes, clever blogging geeks can make changes to the code in Source view, but even that is a rather aggravating. If you can be happy with an illustration as shown here, you can use this method. There is one nice feature: A hyperlink is already present that takes the reader to the full view of the image in SkyDrive, with access to the other pictures in the album (and other public albums and files). If this is not to your liking there is another way. To get control over the image size and placement you can get the address to the i mage – sort of. In the full view SkyDrive, right-click the image. You may see Copy image location, or Copy image URL, or Copy image address. Some browser do not offer the image address (URL) directly, including Internet Explorer, but you can get it by clicking Properties at the bottom of the menu and then copying it from the properties listing. This address can be used in the Live Writer Insert Picture dialog. 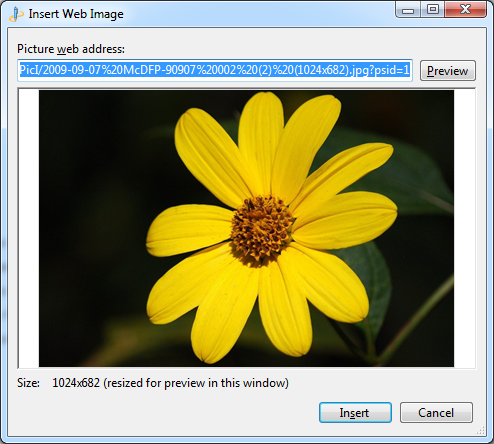 Click Picture in the Insert group of the Ribbon, then click From the web… In the next dialog paste (Ctrl+V) the address of the image. A preview of the image will be shown. If you don’t get the preview, you did not get the address correctly. Click Insert and the picture will be inserted full size into your post. It likely will spill over beyond the post margin. Click on the picture to select it, the Picture Tools tab will be displayed. Click Lock aspect ratio, then select a size, Small, Medium or Large. You can manually set the size, of course. You can set the alignment and margins around the picture and a simple frame, or none, as is usual with web-sourced images. Do not attach a hyperlink to the address you used for the picture. It will not work. You cannot show the image full-size in a browser window. You can get the address of the image in SkyDrive from the browser address bar. 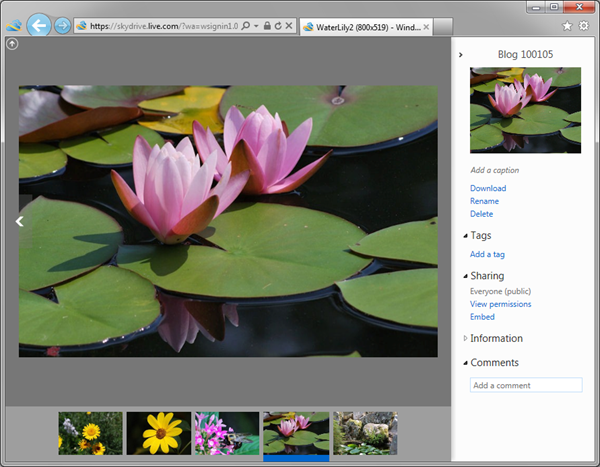 This will give your reader access to that image in your SkyDrive and all other public material. 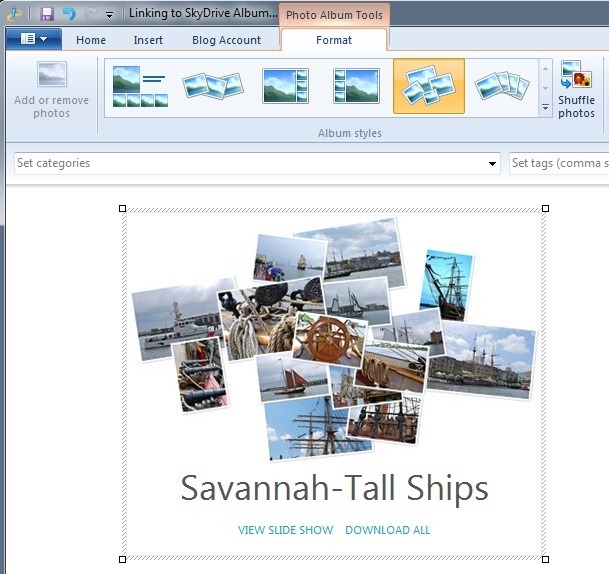 If you do not wish your reader to have access to your SkyDrive album (and more), simply set the link setting in Picture Tools – Properties to No link. 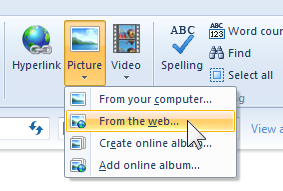 Sadly, the self-running slide show feature is no longer available in SkyDrive. Let’s hope that this is just a temporary shortcoming.